Turtle Buddy recently began offering bamboo straws for sale.Courtesy of the Mueller family. Single-use plastic straws are no longer welcome in St. Petersburg. So says the City Council, which voted to ease them out of use in 2019, by requiring restaurants to provide straws only when thirsty patrons request them. A mandatory ban will follow in 2020. So what’s a straw lover to do? The founders of Tampa-based company Turtle Buddy believe they have the solution. A video of sea turtles debilitated by plastic straws sparked their mission to find and distribute a different option. After watching the turtles suffer, Karrie and Chris Mueller couldn’t keep slipping plastic sippers into drinks knowing that each would take centuries to degrade. One big challenge loomed: The husband-and-wife team owns Xtreme Juice Smoothies in South Tampa. A smoothie without a straw is like a sundae without a spoon. The resulting search for a plastic straw alternative brought with it plenty of Goldilocks references. Paper was too flimsy; it disintegrated into sodden pulp within the thick, icy drinks. Stainless steel straws could be used and reused countless times, but overzealous smoothie drinkers could chip a tooth, etc. Turtle Buddy recently began offering bamboo straws for sale. Polylactic acid (PLA) straws, derived from corn with a classic plastic mouthfeel, proved just right. The Muellers stocked the straws at Xtreme Juice Smoothies and launched their new company halfway through 2018. They chose the name as a homage to the reptiles that inspired it and remain confident in the entity’s e-commerce structure. The couple, graduates of Florida State University who own and operate web and social media marketing firm Webhead Interactive, have launched e-commerce sites before. Turtle Buddy, they say, exists in this space to fill a growing niche and help the planet at the same time. It’s not a perfect solution. PLA must be chemically composted, or it can linger in landfills similar to classic plastic. However, the Muellers see PLA as a step in the right direction. Finding a straw sturdy enough to withstand a thick smoothie without collapsing and that’s more environmentally friendly was their goal. Turtle Buddy straws are available in varying diameters. That way, a lemonade ordered at a beachside restaurant can arrive at the table with a straw that mimics old-school plastic. For smoothies, 7mm diameter Turtle Buddy offerings are recommended. The company also offers customizable straws made of either PLA or bamboo, with straw wrappers that clearly indicate that the sipper inside is not made of conventional plastic. As a wholesaler, Turtle Buddy provides straws in bulk nationwide. Minimum orders are in the hundreds of thousands of units. 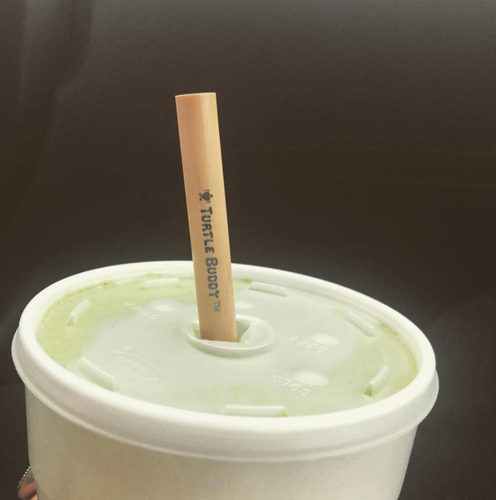 Turtle Buddy straws ship out of Tampa, and the company recently added bamboo straws to the product list that can be stamped with custom logos. Though their reach is nationwide, the Muellers agree that their company’s impact remains local. Turtle Buddy donates to organizations such as the Surfrider Foundation, which seeks to protect the world’s oceans, but also commits to local beach trash cleanup on a regular basis. Future plans include expansion to more straw alternatives as well as to cups, lids and more. The Muellers hope to also extend the company’s community service efforts in 2019. For consumers looking to direct-order reusable straws, St. Petersburg-based Sunshine Straw Co. is a beacon in the thick of the anti-plastic movement. Stainless steel straws are their specialty; they offer a “Sunshine Straw Pack” that features a canvas carrying case filled with straws of various diameters as well as a cleaning brush. They also sell a reusable ‘Sunshine Tumbler’ that brews coffee or infuses water on the go. Chris Mueller hopes that whatever straws consumers choose for their beverages, they think twice before selecting single-use plastic. For more information, follow these links to Turtle Buddy, Sunshine Straw Co., and the Surfrider Foundation.